Unwrap and place slab of cream cheese on a serving plate. Pour or spread a special ingredient on top. Decorate with colorful add-ons (like spices or candy sprinkles) if desired. Serve with your choice of accompaniment: wheat crackers, celery sticks, tortilla chips, rice cakes, etc. Buy chopped sun-dried tomatoes packed in olive oil. Cover cream cheese with tomatoes. For a festive look, sprinkle with dill. Serve with wheat crackers. Use your own homemade pesto sauce or pick up sauce in the produce area (jarred) or dairy case (container). Pour over cream cheese. Serve with vegetable crackers or crisps. Pick up a can of crushed pineapple in the canned goods aisle, or buy fresh pineapple and chop into smaller pieces yourself. Drain liquid, saving pineapple juice for a holiday punch or a cup of brewed tea. Pour pineapple over cream cheese. Serve with rice cakes. Find dried cranberries (aka craisins), or pick your favorite bite-sized dried fruit. Gently press cranberries on cream cheese. Garnish with cinnamon. Serve with rice cakes. Get red pepper or green pepper jelly in the condiments section of the grocery store. Pour over cream cheese, either generously or sparsely depending on the hotness of the jelly and your preferences. Serve with plain or wheat crackers. Get your favorite kind of tapenade. Spread tapenade on cream cheese. Serve with crackers or crisps (try plain versions to make sure that the taste of the tapenade is not overpowered by flavored accompaniments). Grab a jar of chopped ginger. Spread sparingly over cream cheese. Shake red or green sugar sprinkles over the ginger to liven the look of the appetizer. Serve with pita chips. Use extra ginger in salad dressings or stir-fry dishes. Get prepared horseradish from the produce or condiments section. Spread a thin layer over cream cheese; top with lemon peel for added texture and flavor. Serve with vegetable crackers. Peanut butter is a staple in my house, so I can easily grab a jar from my pantry to make this dish. Spread peanut butter over cream cheese. Serve with graham crackers or vanilla wafers for a kid-friendly appetizer. Grab fruit jam, jelly, etc. Dot fruit spread on cream cheese. Serve with graham crackers. Drizzle honey over cream cheese; sprinkle with chopped pecans or walnuts. Serve on crackers or rice cakes. Pick up a jar of your favorite salsa and spread over cream cheese. Serve with tortilla chips or wraps. Make some guacamole, or buy a freshly prepared version. Pour and spread over cream cheese. Serve with tortilla chips. For a fast dish, pour your favorite hot sauce, like Texas Pete's Chipotle Hot Sauce, over cream cheese. Serve with tortilla chips. Stretch the cost of freshly made pimiento cheese (produced at home using this cheddar-based recipe or acquired from your local market) by spreading over cream cheese. Serve with pita chips or celery sticks. Cranberry sauce seems to be plentiful during the holiday season, so you can find some in displays at the grocery store or on the shelf in the canned fruit section, or pull out a homemade batch from the refrigerator. Stir and pour over cream cheese. Serve with crackers. What's your favorite fast-to-make appetizer? You forgot our favorite! Open a can of crab meat, spread it over the cream cheese, top with a jar of cocktail sauce. 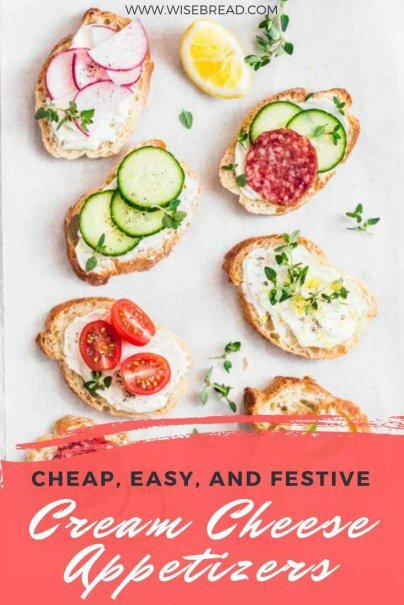 Serve with crackers or cocktail bread. Delish! Thanks Christie. I've never tried that combo but it sounds good and the cream cheese can help stretch the cost of the crab meat. We have fat free cream cheese topped with finely chopped nuts & brown sugar. pop it under a broiler for a minute to carmalize the sugar....YUMMY!! sweet treat We also serve a block of low fat cream cheese on a fancy plate with canned baby shrimp on top. Drizzle red cocktail sause over, garnish with chopped green onion. Always been a great hit.